Similiar to the Packed Decimal field, the purpose of a Redefine is to conserve bytes on disk. The Redefine in its simplist terms redefines a contiguous group of bytes. Typically, the selection of what definition to use for the given area of bytes is based on a key, which is just another field in the current row. The Redefine Column in this example is simply the contiguous 10 bytes of space in every row at the same position. 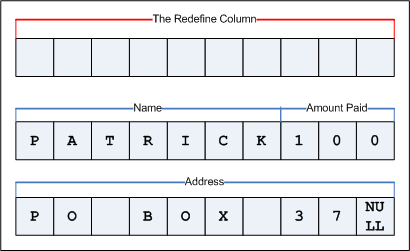 The Redefine Column will be made up of 1 or more definition collections that will define the groups of bytes within this contiguous space. In this example, we have two definition collections, one representing Name and Amount Paid fields for a given row and another using the entire space for a single definition of Address. The definitions can be a regular column representing text and/or numbers and they can also be Packed Decimal fields consisting of Comp-3 and Zoned bytes.